I need to ask for opinions, seeing that I am apparently incapable of deciding myself. Regarding the LO I just posted on the previous page, which one do you think looks better, the black or the white background? And another silly question (I can't believe that I have to ask this!) - This photo was taken on 31st December 2016, just before the clock ticked over to 1st January 2017. Should my title be Happy New Year 2016 or Happy New Year 2017? I guess I could save myself the confusion and title it "New Years Eve 2016". AussieMeg I like it better on the white background. And I would go with 2017 as that's the year you're ringing in. AussieMeg - love it - and prefer the white because it draws focus to the photo. The black is stunning, but because there is contrast up with the bubbles/glasses your eye gets pulled there. Gorgeous page, AussieMeg! I agree that Happy New Year 2017 is correct, as 2017 is the new year. I like them both, but I think I prefer the black background. It emphasizes that this took place near midnight. KelleeM - you did an amazing job on the December album! 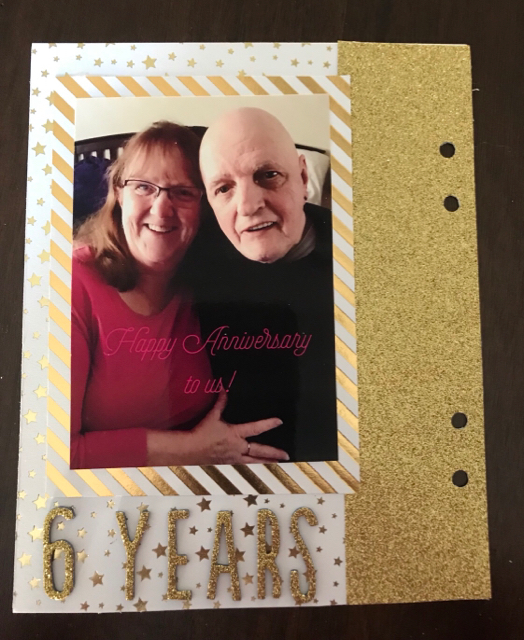 linda - your NY's cards are so pretty! Great title work on the Curry page. elaynef - the Love layout is beautiful and those pictures are amazing! AussieMeg - what a beautiful picture! The papers and embellishments were made for it! I'm loving your NYs page - the blues are so pretty and the glitter paper is perfect for champagne bubbles and I agree with grammadee about the black background for the same reason. grammadee - Love the clock on the NYs page! 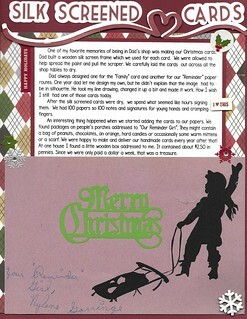 I like the tags and the cute little Teddy on your December page and love all the blues and layering on your Santa page. Oooh, I love the double embossing on the card! The christmas pages are so festive..I'm loving that tree paper. Chinagirl828 - congrats finishing your December album. The cover is lovely. Here's my first 12x12 layout in months! elaynef , I love all the beautiful blues you used on your pages with Ben and the other grandkids. Really nice photography too! nylene , great journaling! and a really lovely page. Those little gift packages are so much fun! AussieMeg , wow! the colors are just amazing - just perfect for your beach photos! Really, wow! And I'm glad you went with the white for your New Year page. I like the drama of the black background, but I agree that the photo got lost on that one. My eyes go right to the photo with the white background. grammadee , great background paper on your New Year page! But my favorite element is that foil snowflake paper - love the sparkle! And the smiles on the faces of your grandsons on Santa's lap is priceless! 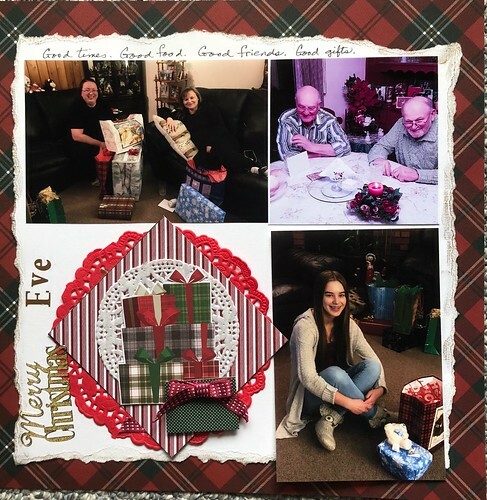 Really amazing clusters on your group photo Christmas pages - I'm so impressed and inspired by them - really great textures! Chinagirl828 , what a great feeling to have finished a project! Beautiful cover too. I love the elegant simplicity of your style! 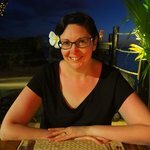 That page is GORGEOUS, msliz! LOVE the colours, the design, that spray of dots and flowers, the butterfly! Gorgeous, I say! Welcome back to scrapping. I hope this is the first in an avalanche of pages. Here is my page for today. I started with the Sketchy Saturday sketch for yesterday, but you would never know that unless I tell you. I need to count up my points for this page and the pages and card I posted yesterday. Don't want to get too far behind in the paperwork . And a quick two pager based on kiwigirl 's Sketchy Saturday challenge on December 15th. Still have not done my homework. Need to add up my points this evening. I have a question, about Challenge #33, AussieMeg : Do squares positioned on point qualify as a diamond? I haven’t added up points yet (new year same song). 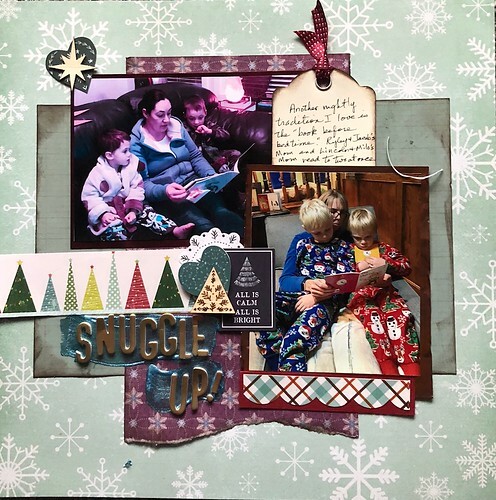 This is the next to last page of my December album. This is the last page. We were married at midnight on NYE. I was inspired by lots of recent memes on Facebook. I did two quick pages with old pictures of dd (1990). Thanks yall for the compliments on the photography. The boys' mother, my dd#3, is a professional photographer in lubbock, texas. She specializes in newborns. As you can imagine, we are very proud of her talent and hard work. The boys are so good to cooperate with her and also with me and dh as we all have a camera attached to us much of the time. One thing for sure, I don't have to worry about running out of something to scrap. I have a question, about Challenge #33, AussieMeg: Do squares positioned on point qualify as a diamond? 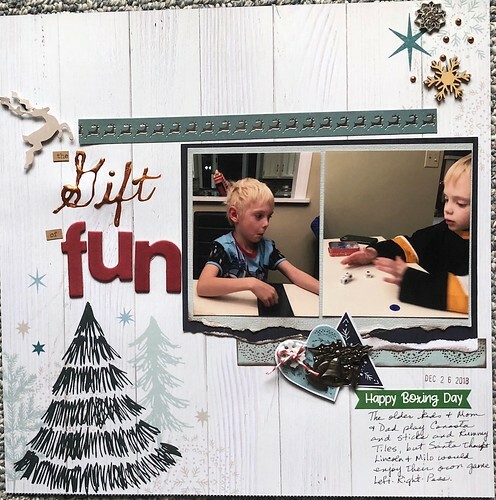 Two quick pages this morning, using (mostly) Kaisercraft Wonderland Collection that made up my Scrapbooking Fanatics December 2018 kit. I almost hate to post these pages. I did want the story added to My History Project, but they certainly didn't turn out like I planned. I will probably redo them sometime, and I NEVER redo a page. This was for 12 Days of Christmas #11, based on ad. Unfortunately the only part of the layout that still looks like the ad was the ribbon hearts at the top. ...oh well. 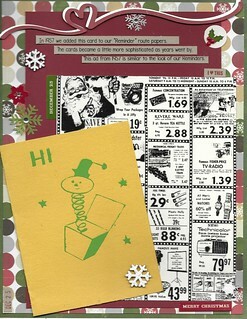 #2 12 Days of Christmas 11, #3 Rectangles #5 Donna Challenge, no equation, #15 Dots, #21 Sparkle glitter, #24 Dies, #28 No photo, #30 Stamp #33 Diamond shapes, #36 Typed journaling #37 Lots of journaling, #44 Paper that is 8 years old =2 pts, #46 Pop Dots, #52 Snowflakes, #53 Red, #55 Wooden snowflakes, Bonus-added stickers, one page posted =24 pts. my Bonus item, stickers, one pages posted =17 pts. msliz , I love your page, Incognito. You frames with perfect tiny Nuvo dots are beautiful. That bottom photo/negative is so cool. Your black and white floral embellishments are such a nice touch. Very classy layout. KelleeM , your Pierced Ears layout is adorable. What a sweet baby. I love the pastels and especially those tiny pastel bows. Beautiful. I love the clusters on your Cousins layout. The blues and greens are so pretty layered together. I left love in the gallery on your DD pages. grammadee , you are back to your speedy scrapping. Glad you are recovered from the trip and are hard at the scrapping! You have love in the gallery. AussieMeg , I agree with the majority. I love the white background that lets the photo really pop. Wonderful page. Left love in the gallery. KikiPea, your layout is gorgeous. I love the design and the way you have layered so many beautiful patterns together. Your dog is beautiful, by the way. Such a clever title and fun embellishments. Fabulous job!! another ketchup sketch... 2 page today for our challenge. Will be back to comment on your pages, KelleeM , nylene , elaynef and KikiPea . 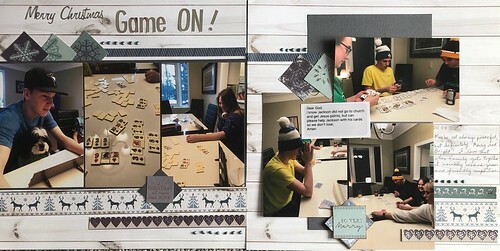 Here are two more of my Christmas pages. @kellem I LOVE those baby pages--sooo cute! And that meme page is a wonderful way to preserve those inspirational quotes. I think I left love for your other pages in the Gallery. Loved your DD. KikiPea , those dog pages are darling. Love the photos and that dog in antlers is definitely smiling! Great layering, too. Great take on stinkerbelle 's sketch. Love the bows. And the roadtrip page is awesome. Love that your photos capture so many of the details of the trip. Great take on THAT sketch, too. elaynef, I love the blues on your pages with those photos, and the multicoloured stripes are perfect to represent the popsicles! So glad you have your room back and you have time to play along. 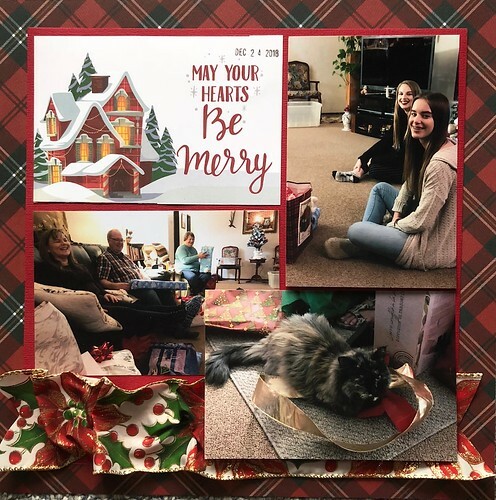 nylene, I am loving the stories of the Christmases of your childhood, and I am sure your kids and grandkids will love them too. Love the screen prints. And that diecut heart border is really cool, too. This is the title page for my Hawaii 1989 album. 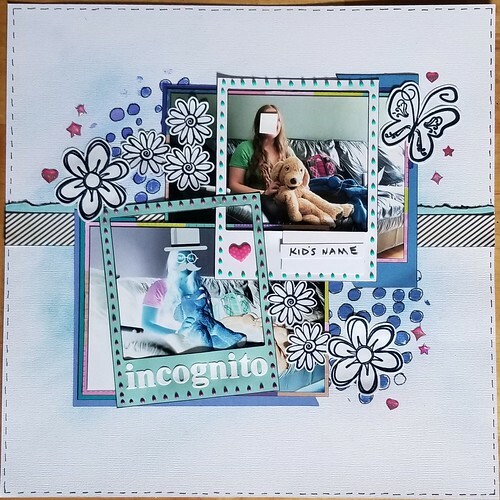 Now I must point out that I deserve none of the credit for this page, I used a template and all I did was add some extra elements and the photos - my only skill was to choose a really cool template to buy! I'm already behind on commenting - going to try and catch up - hopefully I don't miss anyone. 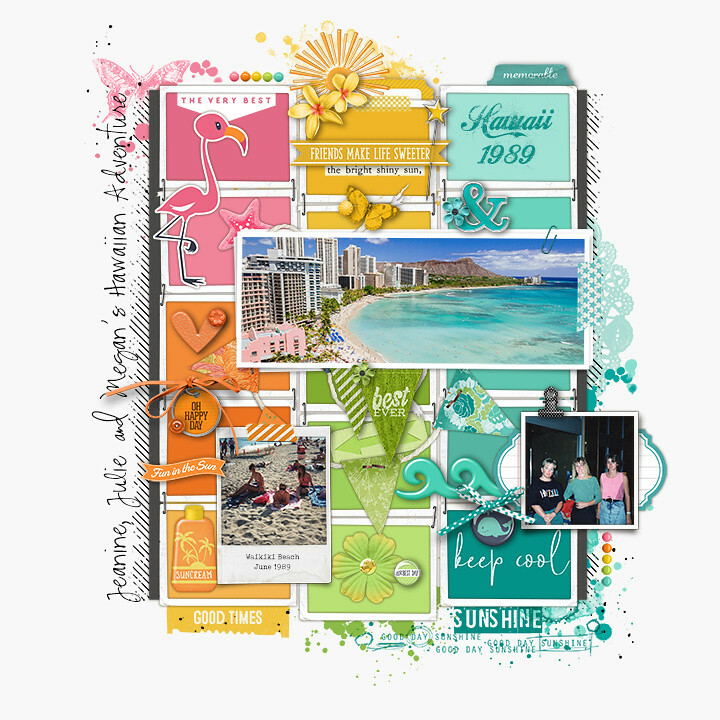 AussieMeg - that IS an awesome template - I love the colours and they are perfect with your pics! 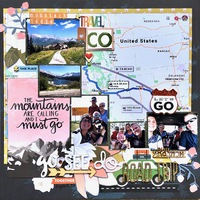 KikiPea - I LOVE your road trip page - so many fun details! 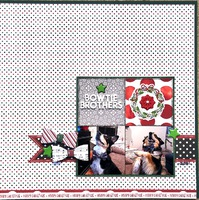 The Bowtie page is cute - love the photos and the bowtie embellishments! And those reindogs are so sweet! such a fun page! nylene - I'm sorry that you're not happy with your layout - I hate when that happens. 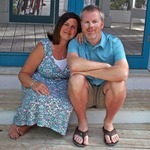 I love that you're documenting the stories for your family - they'll love them! grammadee - the Boxing Day layouts are lovely - the wintery colours are great! KelleeM - wow - you've been busy! 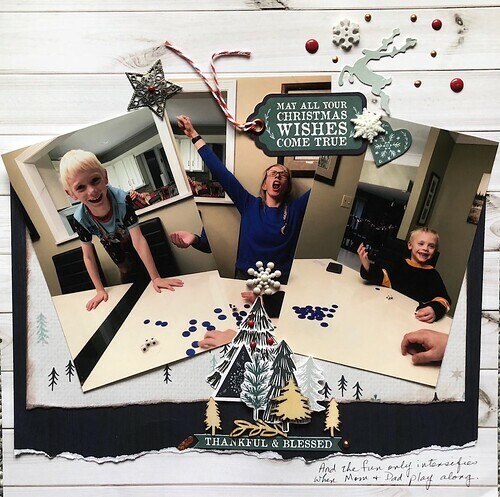 The Cousins page is so sweet - love the flower clusters! Your DD was a beautiful baby - I love the heart with a bow on the earring page! The storytelling page is awesome - great job! Happy Anniversary - beautiful page for that! 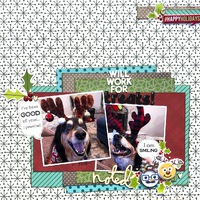 Great job finishing up your Dec album - and documenting starbucks! grammadee - you've been busy also! Game On! is a fun page - love the colours! Snuggle Up is adorable! That all is calm...card is perfect! That Hawaii page is awesome, AussieMeg! Love the colours you chose. Great that you are documenting fun from "way back when." Great way to use those "diamonds" as a border, Linda . Love the pops of colour on the grey.